SynaMan allows uploading files from your machine to a host machine using your browser. This page displays some helpful tips on how to upload files using different browsers. 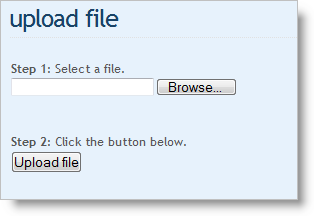 Step 1: Select a file from your machine to be uploaded. Depending upon the browser you use, the screen for selecting file may look different. The following images display how file selection is performed on different browsers. 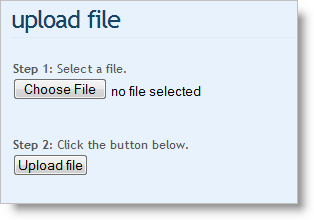 Click the Browse button to choose a file. You also manually type a path, however, clicking the Browse button is strongly recommended to avoid typing incorrect value. This is similar to Internet Explorer. 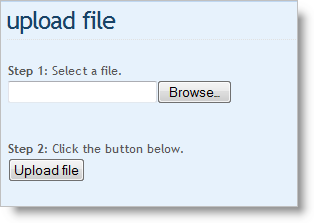 Click the Browse button to choose a file. The browser automatically opens the Browse window if you try to type anything in the text box. Unlike IE and Firefox, Apple Safari does not display a text box. 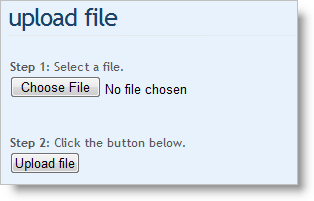 Instead, it only contains a button that reads Choose File allowing the user to select a file. After selection, the file name is displayed in the text box on the side. Google's browser behaves exactly like Apple Safari. It does not contain any text box and user must click the Choose File button.